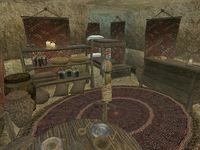 The St. Olms Canal North-One is the residence of Eralane Hledas accessed from outside and located on the Canalworks level in the northern part of the St. Olms canton in Vivec. In the southeastern corner are several sacks containing random ingredients and a wooden barrel storing cheap food. There is also a single gold coin hidden underneath a hand basket on the middle shelf. Along the western wall is a dresser holding random common clothing, on top of which lies a common shirt and 12 gold coins. In the southwestern alcove is a bunk bed owned by Eralane. 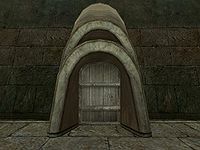 The two baskets in the southern corners and the chest beside the bed have a slight chance of containing special and marksman loot. Additionally, the chest has a 25% chance of containing a restore attribute potion.